VB friend and contributor Rowan Adams makes a visit off the Island, but finds some reminders of home. I left the Island behind for a few days recently to visit friends and explore Norfolk, Suffolk and Cambridgeshire – but I found a few reminders of home. Islanders may make wind turbine blades, but we don’t get many chances to see them in action. So it was very encouraging to see the name of Vestas on a working turbine. I stopped counting after about three wind farms and four individual turbines. Well done at least some of the locals for the imagination to realize that wind turbines make their Big Blue Sky more beautiful as well as helping to protect it from climate change. Those locals included the Norfolk Wildlife Trust, with a wind turbine at the Cley Marshes Nature Reserve, ‘internationally reputed as a premier birdwatching site’. And it’s not just the wind. In Ely I came across a public loo with solar-heated water for the basins. 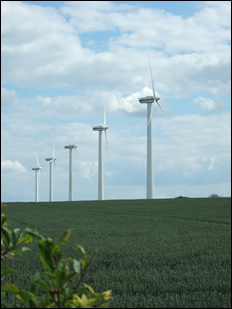 But whether you think wind turbines ugly or beautiful, we need to recover from our dangerous addiction to fossil fuels. If we don’t want wind turbines, we still need renewable energy, and we need enough of it – the sums have to work. And on the same trip, in Heffers bookshop in Cambridge, I found the book that can help do just that. It’s the best book I’ve ever seen on renewable energy. David JC MacKay’s ‘Sustainable Energy – without the hot air’ gives the actual figures we need to understand how to survive without fossil fuel. And amazingly he’s made the whole thing available free online. 27 Comments on "Big Blue Sky – And No Hot Air"
Yes, on our regular trips to the Broads we have seen wind tubines all over Suffolk and Norfolk. We moored about 100 yards from one up near Martham – no noise all night and in a land of windmills they are just the next extension of a simple technology. They would much prefer just 1 Nucleur power station to take over when the lights go out. Why do these anti developing technologies people insist on posting rubbish stats again and again. Blimey! If that’s what it takes to be called ‘young man’, even by a know-it-all like colin, I must remember to do this more often. See what I mean? No argument = slag people off. Just can’t help yourself can you. Sticks and stones old boy! Nail on head.Let the Dinosaurs have their say. Would you care to put up the verifiable source for this “fact” Joe? well you can pick and choose your expert…because there are dozens on both sides. Your expert is no more credible than any other, therefore a ‘fact’ is not a fact at all, it is a guess..and I like Joes version of a guess. for some reason i thought 18 months was 2 years, please read 24 months.